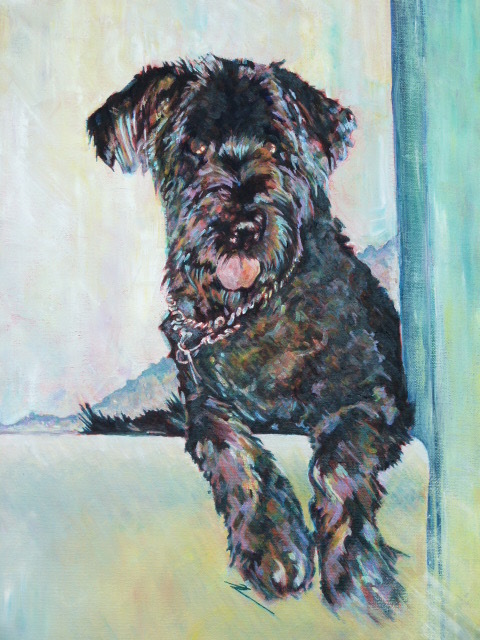 This is a painting of a Briard (clipped for the summer) eagerly awaiting any excuse for a bit of excitement. Anyone who has ever owned a Briard will recognise the heart shaped tongue that continually sticks out, especially at rest, and the contained energy and sense of fun just waiting to burst forth any time and any place. This is an energetic breed with great sense of humour and always ready to get up and go, even after a long tiring day. His favourite place was the top of the stairs so he knew exactly what was going on and where. This work is an unframed acrylic, painted on canvas board 45.5 cm x 35.5 cm / 17.75" x 13.5" ready for framing.